Scotland NC500 day 2. 150 miles. Ayr to Glencoe. I had a lovely comfortable warm sleep and therefore wake up without any prodding from Ren and feeling refreshed. We are up so early even the onsite shop is not open to pay for our stay. We decide to take a short stroll across the fields to gaze out to sea. My lungs expand filled with fresh clean sea air and with it comes a sense of well being and peace. This is how mornings should be. Time to breathe, time for stillness and time to take a stroll and gaze at nature's beauty. Not throw some toast down your throat and bang the door shut as you stumble into the car to race to work. OK to be honest I don't hate my job. I hate how many hours of my life it takes up. I feel so exhausted when I finish I have zero energy to do much once I do finally get home. This is what frustrates me the most. I have so much I would like to do but no time or energy to do it. Work takes all that from me. The last couple of years I have struggled to find a work life balance and it is getting worse. The idea of having to work another 20 years before I can retire is rather depressing to say the least. I would retire in a heartbeat if I had the finances to do so but I do not. I do have these rare holidays and I will therefore makes the very best of them. Despite the forecast of rain we decamp in the dry and set off in the dry. However the forecast proves correct and we have to pull on our waterproofs soon enough. So its raining, so what - I do not let it dampen my spirits. 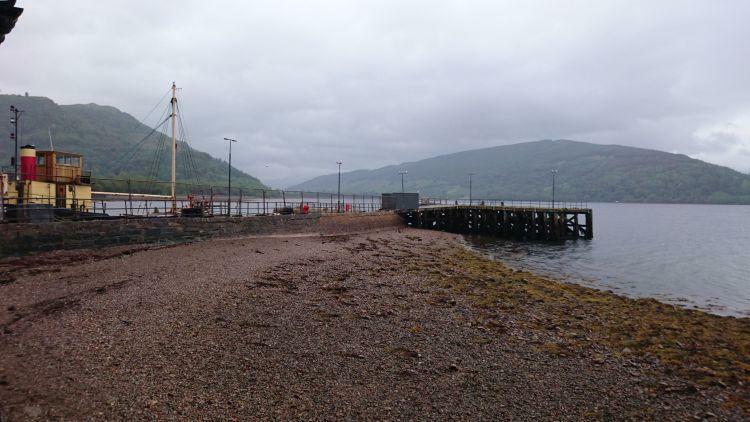 We are riding from Ayr via the ferry to Dunoon. I still feel uneasy about ferries, even more so on the taller Kawasaki. Fortunately as we ride up to the ferry it is in dock and we simply ride straight onto it, no waiting around for nerves to develop. 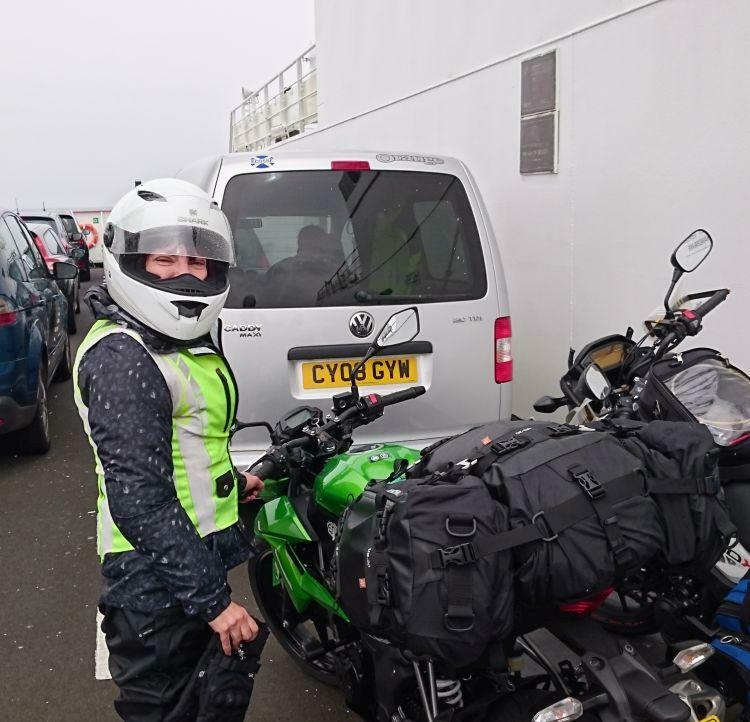 The ferry rocks around a bit and as I grab hold of the bike to keep it stable I am glad it is a short crossing. I get sea sick easy and I never thought to bring any anti-sickness tablets on this trip. Getting on and off the ferry even in the rain proves easier than my fears believe it to be. As they say feel the fear and do it anyway. I hope Ren is not looking for his handbrake. Yes it is grey and raining but it is still beautiful and I am still rocking and rolling. 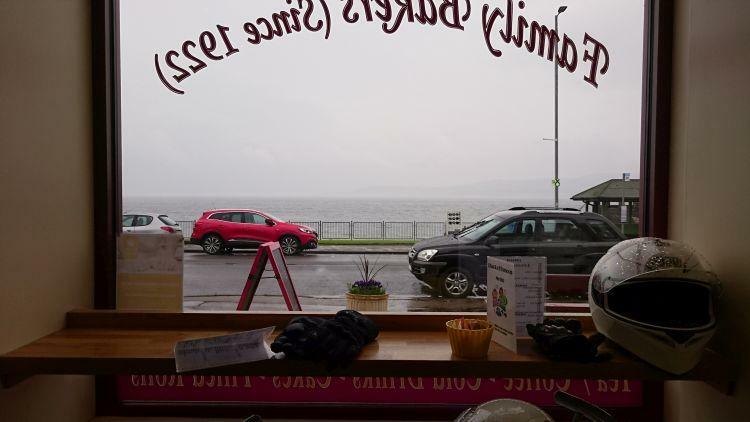 Once off the ferry we stop for something to eat in Dunoon. I get off the bike and stare at the space where my disc lock should reside. It is not there. My mind however refuses to accept this unfortunate circumstance so l just stand staring some more. Maybe if I stare hard and long enough it will magically appear. I mean it simply has to be there. I double checked twice that the bag the lock came in was secure so how can it be gone? But gone it has and despite checking the whole bike over...in case it was playing hide and seek and would pop out someplace else, I finally decide that standing here in the pouring rain is not going to bring my lost lock back. I feel stupidly over emotional over this mishap. It was just a lock, not a cheap one so yes that is a blow but it's nothing major so why so sad? Sad, did I mention sad...Sad sack hears his name being called and I expect he has awoken from his slumber. When you are not on top form even small things can upset you way more than normal. 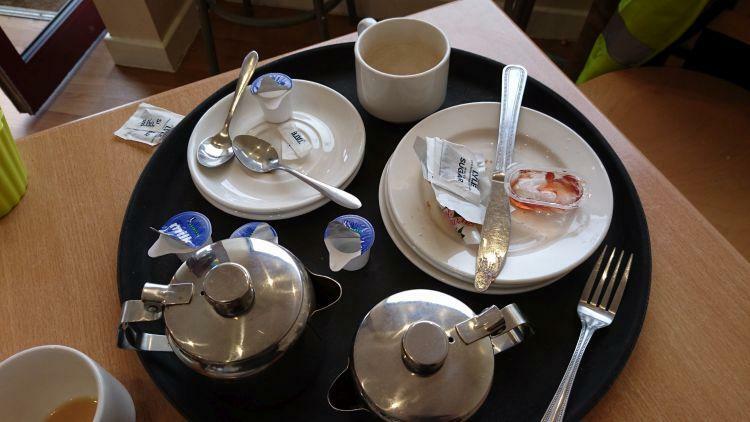 Good food served with a smile and time to dry out a little makes me feel slightly better. Come on Sharon it is just a lock. Lost into the mists of the loch lies my lock and lost into our tummies are our meals. 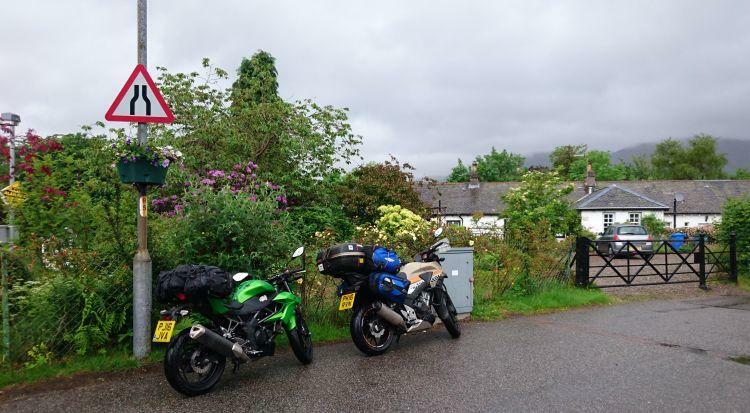 Back onto the bikes and into the rain we ride the A815 to Inveraray. What a road!!! Wow, wow, WOW!! The scenery is sublime. The Mountains shrouded in mist take on a mysterious and magical aura. I almost expect to see dragons soaring through the clouds from the tops of the hillside. Quaint cottages with blooming gardens hug the roadside. There is hardly any traffic so we can keep our speed up on this lovely winding road. Happiness. Sad sack cannot track me down now, the road is too fast and winding, the trees too dense and the mountains too high. I can not stop smiling, I am simply so filled up with glee. This amazing country makes my heart beat with joy as my eyes feast on all the dramatic beauty that surrounds me. If you love riding, if you love nature you have to come and ride these roads. No words are adequate to describe the beauty or to describe the serenity it instils into your soul. I am loving this ride. The bike feels fantastic and I am feeling very confident in my riding. I am strange but I like riding in the wet. It seems I possess some natural ability in the wet that allows me to ride well and keep up easily with Ren. I am not scared of the wet, I tend to be more nervous of the dry...go figure. It seems I am happy to push my bike to its limits in the wet where as in the dry I still cant seem to push the bike to half its potential. Haa well with the amount of rain in this country at least I can look like a good rider most of the time. Sleepy seashores and cosy cottages make for a feeling of space and restfulness. My heart rate increases even more as we ride and I even get a chance to practice my overtaking. Being on a 125cc for so long I have not had much practice in this area. The fact I need more practice is clear, it was not a dangerous overtake but the car approaching me closed in faster than I would have liked. So note to self, when travelling at high speed remember that any oncoming traffic is also doing so. Anything that looks a long way off will in seconds be up close and personal. 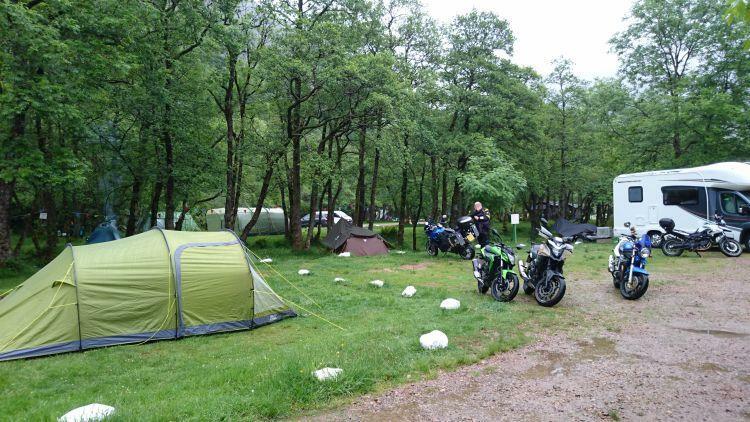 The fantastic ride comes to a end when we reach our destination, Red Squirrel Campsite at Glencoe. It is a sharp downhill gravel path to access the site so my heart rate stays elevated. The uneven, rutted path makes me nervous..times like this I want to be on my little 125cc because the ability to flat foot on my Keeway gives me far more confidence in situations like this. 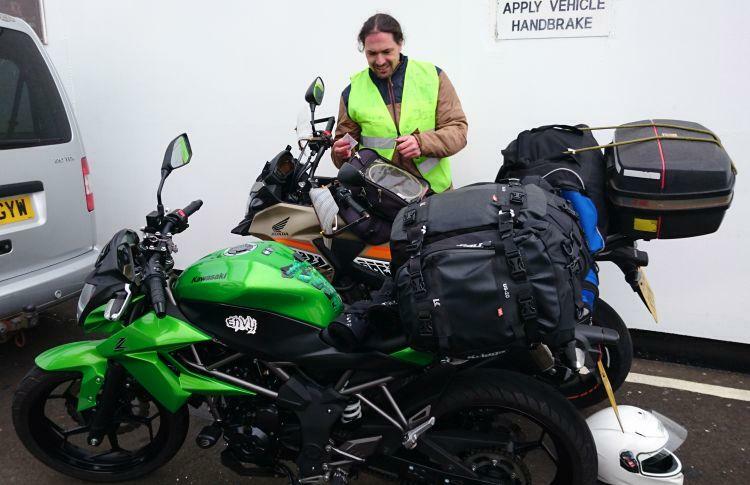 A member of the Chunky Tread Club, Kelvin is already onsite and directs us to where he has pitched up. I manage to slither and slide myself to a stop successfully and unload the bike. But what is this I see...not only have I lost my lock I have also lost some paintwork from the rear of my bike...NOOOOOooooooo!! Arghhhh!! The luggage is still standing clear of the paintwork but I suspect the rough roads have caused the bags to jump up and down and therefore rub some of the paint away. Whyyyy did I not put some matting underneath, whyyyy am I so stupid??? Damn it to hell I am very annoyed with myself. However the midges soon distract me so I get on with getting the tent pitched as soon as possible. 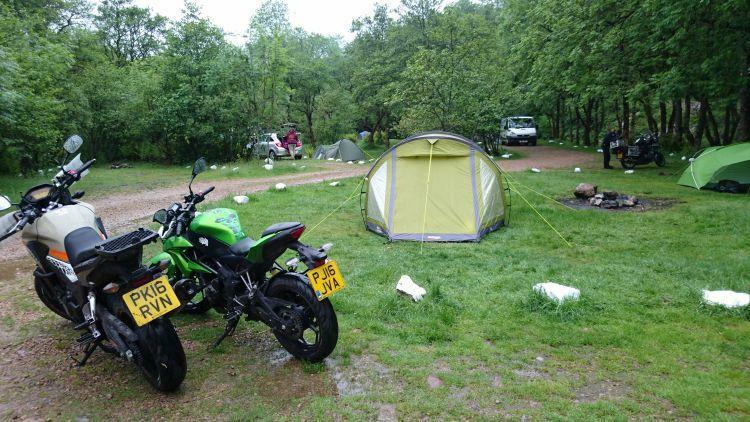 Trees and wet bring forth the wee beasties.. get that tent up quick. Another Chunky member is also already here with her camper van. The lovely Sue spoils us rotten with cups of hot tea and an invite to sit in her van to dry out. While chatting in the van more sodden Chunky Treaders begin to arrive. Everyone is wet and tired. Sue's hospitality provides a cosy warm haven to all. We spend a delightful evening taking the mick out of one another and having a good giggle. Bernard falls asleep in mid conservation and his gentle snoring reminds us all what a long day it has been and that it is time for bed. I snuggle into my sleeping bag once again with a huge grin on my face. What a wonderful day filled with twisty roads and round the twist friends... Perfect. Do you have a great motorcycle product you'd like to promote? We're always looking for interesting stuff to look at and review. Please drop a line to ren@bikesandtravels.com.